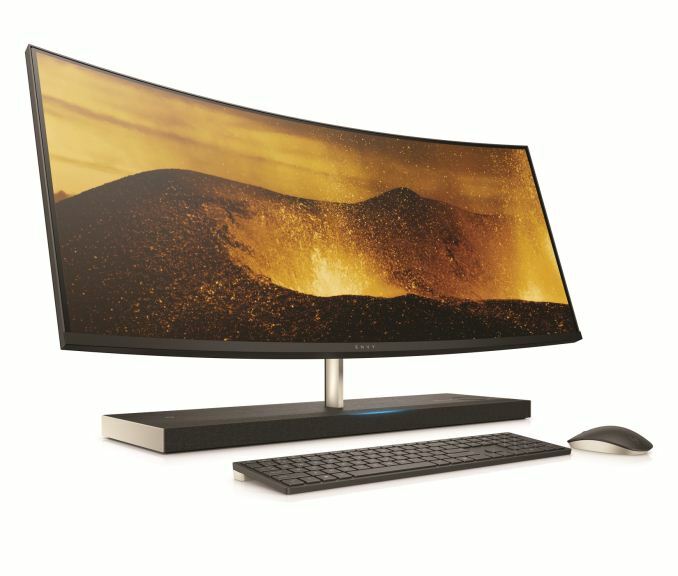 HP has announced a new version of its top-of-the-range Envy 34 all-in-one computer. The new PC has a six-core CPU along with a new graphics processor. One of its most notable improvements is the added Amazon Alexa assistant, as well as woodgrain-like finish on the back. Keeping in mind that Alexa is compatible with various ‘smart’ IoT devices, the addition will enable owners of HP’s 2018 Envy 34 systems to control things like lights or heating using their voice. HP’s new Envy 34 is based on the Coffee Lake platform, so it has up to six cores available and Intel’s latest chipset with all of its features. The Envy 34 remains the world’s only 34-inch curved AIO PC and the most powerful one too. HP uses Core i7+ processors, with Intel Optane Memory SSD caching modules (on select configurations) accompanied by NVIDIA’s GeForce GTX 1050 discrete GPU for the new Envy 34, which is a significant upgrade in terms of compute horsepower. The use of a hybrid storage subsystem, instead of a traditional HDD on entry-level configurations, indicates that the more affordable 2018 Envy 34 models will offer responsiveness of SSD-based PC while retaining the high capacity of a HDD. As for memory, the new systems will feature up to 16 GB of DDR4 memory. 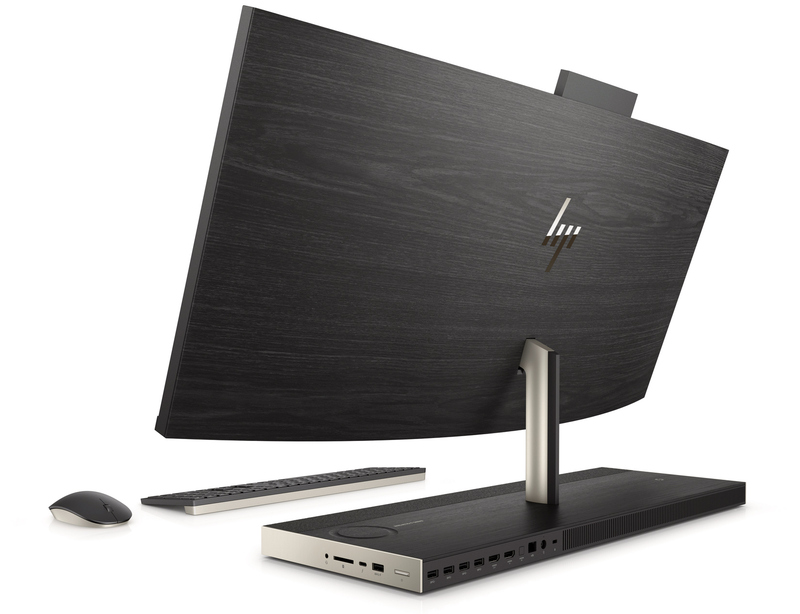 HP understands that a premium AIO PC has to look gorgeous not only from the front, but from every angle, so the new Envy 34 comes with a woodgrain finish on its back. The producer admits that it does not use a real veneer, due to manufacturing complexities, costs (using veneer made of old trees for a PC is expensive), and thermal concerns, but the look of the material used is said to be virtually indistinguishable from the wood. An interesting thing to note here is that Mercedes uses real wood that looks like plastic in contemporary E-class cars just to distinguish them from the more expensive S-class vehicles which use wood that looks like wood. 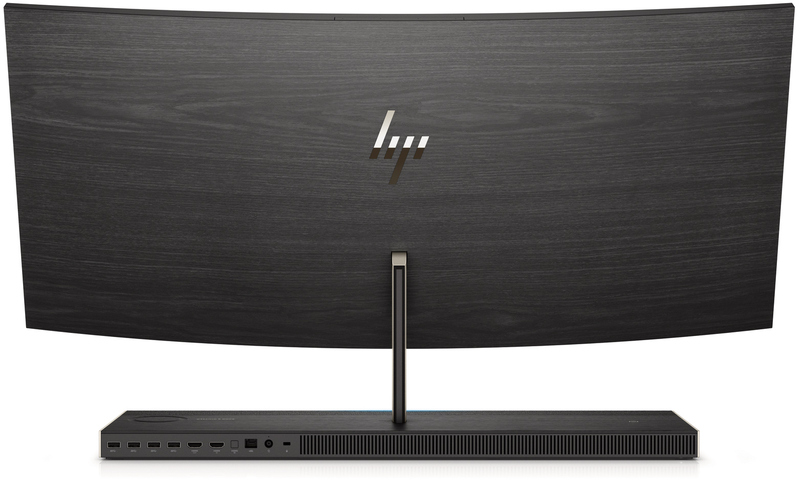 An important feature of the 2018 Envy AIO system is HP’s new pop-up Full-HD webcam that physically turns on only when needed by Skype or other appropriate Windows 10-compatible programs. Just like its smaller 27-inch brethren, the Envy 34 comes with an advanced sound bar co-developed with Band & Olufsen as well as touch-sensing bars. For I/O, there are natural things that one would expect from a modern PC these days: 802.11ac Wi-Fi, Bluetooth, USB Type-A ports, HDMI input and output, etc. To top it off, the base of the Envy 34 can also wirelessly charge smartphones through the wireless pad on the base housing. HP’s new Envy 34 will be available later this year. The manufacturer has not announced pricing. I wish there were some USB-A ports, the SD card reader and headphone jack on the front with the Thunderbolt 3 ports moved to the back. Not a fan of the side ports. Also it would be nice to include an integrated PSU. From the look of it, there is gonna be a nice big external brick. Not of a fan of that either. Which means system is portable - but I can dock it up also. On this product - I not sure this is high resolution like 35U88B or the lesser resolution version.